For other uses, see Red Cloud (disambiguation). Red Cloud (Lakota: Maȟpíya Lúta) (1822 – December 10, 1909) was a very strong war leader and a chief of the Oglala Lakota. He led as a chief from 1868 to 1909. One of the most capable Native American opponents the United States Army faced, he led a successful campaign in 1866–1868 known as Red Cloud's War over control of the Powder River Country in northeastern Wyoming and southern Montana. After signing the Treaty of Fort Laramie (1868), he led his people in the important transition to reservation life. Some of his US opponents mistakenly thought of him as overall chief of the Sioux (Dakota, Lakota, and Nakota). The large tribe had several major divisions and was highly decentralized. Bands among the Oglala and other divisions operated independently, even though some individual leaders such as Red Cloud were renowned as warriors and highly respected as leaders. Red Cloud was born close to the forks of the Platte River, near the modern-day city of North Platte, Nebraska. His mother, Walks As She Thinks, was an Oglala Lakota and his father, Lone Man, was a Brulé Lakota chief. These were two of the major seven Lakota divisions. As was traditional among the matrilineal Lakota, in which the children belonged to the mother's clan and people, Red Cloud was mentored as a boy by his maternal uncle, Old Chief Smoke (1774–1864). Old Chief Smoke played a prominent, major role in the boy's early-mid life and brought him into the Smoke household when his parents died around 1825. At a young age, Red Cloud fought against neighboring Pawnee and Crow, gaining much war experience. Red Cloud's War was the name the US Army gave to a series of conflicts fought with American Indian Plains tribes in the Wyoming and Montana territories. The battles were waged between the Northern Cheyenne, allied with Lakota and Arapaho bands, against the United States Army between 1866 and 1868. In December 1866, the Native American allies attacked and defeated a United States unit in what the whites would call the Fetterman Massacre (or the Battle of the Hundred Slain), which resulted in the most U.S. casualties of any Plains battle up to that point. Following this battle, a US peace commission toured the Plains in 1867 to gather information to help bring about peace among the tribes and with the US. Finding that the American Indians had been provoked by white encroachment and competition for resources, the commission recommended assigning definite territories to the Plains tribes. The Lakota, Northern Cheyenne, and Arapaho bands, and others settled for peace with the US under the Treaty of Fort Laramie. The US agreed to abandon its forts and withdraw completely from Lakota territory. The treaty established the Great Sioux Reservation, covering the territory of West River, west of the Missouri River in present-day Nebraska (which had been admitted as a state in 1867), and including parts of South Dakota. Uneasy relations between the expanding United States and the natives continued. In 1870, Red Cloud visited Washington D.C., and met with Commissioner of Indian Affairs Ely S. Parker (a Seneca and U.S. Army General) and President Ulysses S. Grant. In 1871, the government established the Red Cloud Agency on the Platte River, downstream from Fort Laramie. As outlined in the Treaty of 1868, the agency staff were responsible for issuing weekly rations to the Oglala, as well as providing the annually distributed supply of cash and annuity goods. The agent and Washington officials would determine how much of the annuity was to be paid in cash or goods, and sometimes the supplies were late, in poor condition, inadequate in amount, or never arrived at all. Red Cloud took his band to the agency (a predecessor of the Indian reservation) and tried to help them in the transition to a different way of life. In the fall of 1873, the agency was removed to the upper White River in northwestern Nebraska. Red Cloud settled at the agency with his band by the fall of 1873. He soon became embroiled in a controversy with the new Indian agent, Dr. John J. Saville. Although Red Cloud was unsuccessful in finding a peaceful solution, he did not take part in the Lakota war of 1876-1877, which was led by Tȟašúŋke Witkó (Crazy Horse) and Tȟatȟáŋka Íyotake (Sitting Bull). In the fall of 1877, the Red Cloud Agency was removed to the upper Missouri River. The following year it was removed to the forks of the White River, in present-day South Dakota, where it was renamed the Pine Ridge Indian Reservation. 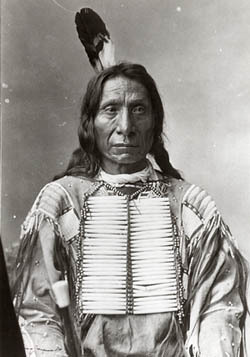 Red Cloud became an important leader of the Lakota as they transitioned from the freedom of the plains to the confinement of the reservation system. His trip to Washington, D.C. had convinced him of the number and power of European Americans, and he believed the Oglala had to seek peace. In 1884 he and his family, along with 5 other chiefs, converted and were baptized as Catholic by Father Joseph Bushman. Red Cloud continued fighting for his people, even after being forced onto the reservation. In 1887 Red Cloud opposed the Dawes Act, which broke up communal tribal holdings, and allocated 160-acre plots of land to heads of families on tribal rolls for subsistence farming. The US declared additional communal tribal lands as excess, and sold it to emigrant settlers. In 1889 Red Cloud opposed a treaty to sell more of the Lakota land. Due to his steadfastness and that of Sitting Bull, government agents obtained the necessary signatures for approval through subterfuge, such as using the signatures of children. He negotiated strongly with Indian Agents such as Dr. Valentine McGillycuddy. He outlived all the other major Lakota leaders of the Indian Wars. He died in 1909 at the age of 87 on the Pine Ridge Reservation, where he was buried. He is quoted as saying in his old age, "They made us many promises, more than I can remember. But they kept but one--They promised to take our land...and they took it." Announcements of the death and recognition of Red Cloud's achievements were printed in major newspapers across the country. As had been typical of the US perception during Red Cloud's prominence in war, the article in The New York Times mistakenly described him as leader of all the Sioux bands and tribes, but noted his abilities as a leader and diplomat. While he was a prominent leader, the Lakota were highly decentralized and never had one overall leader, especially of the major divisions, such as Oglala and Brulé. Red Cloud was among the Indians photographed by Edward S. Curtis. In 2000, he was posthumously selected for induction into the Nebraska Hall of Fame. He has been honored by the United States Postal Service with a 10¢ Great Americans series postage stamp. Theodore Sorensen wrote in Kennedy that President John F. Kennedy considered naming one of the 41 for Freedom ballistic missile submarines after Red Cloud, but apparently bowed to Pentagon concerns that the name could be misinterpreted as being pro-Communist. Oliver Red Cloud died July 4, 2013 at the age of 93. He was the fourth-generation direct descendant of Chief Red Cloud. Oliver was a chief of the Oglala Lakota people and Speaker of the traditional Lakota Sioux Nation. He was the Chairman of the "Black Hills Sioux Nation Treaty Council". ↑ "Red Cloud". New Perspectives of the West. http://www.pbs.org/weta/thewest/people/i_r/redcloud.htm. Retrieved October 22, 2012. ↑ Griske, Michael (2005). The Diaries of John Hunton. Heritage Books. pp. 64–69. ISBN 0-7884-3804-2. ↑ Ross A. Enochs, 1996, The Jesuit Mission to the Lakota Sioux, p. 26. ↑ "Native American Words - Tsa-la-gi-ti-a-ye-li". Spirit_cherokee.webs.com. http://spirit_cherokee.webs.com/nativeamericanwords.htm. Retrieved 2013-04-20. ↑ "Red Cloud, Sioux Chief, Dead; Old Indian Warrior Caused The Massacre Of Fort Phil Kearney.". New York Times. December 11, 1909, Saturday. http://query.nytimes.com/gst/abstract.html?res=9802E0DD1239E733A25752C1A9649D946897D6CF. Retrieved 2008-05-29. ↑ "Red Cloud Gone to Final Rest". Boston Globe. December 11, 1909. http://pqasb.pqarchiver.com/boston/access/712158952.html?dids=712158952:712158952&FMT=ABS&FMTS=ABS:AI&date=Dec+11%2C+1909&author=&pub=Boston+Daily+Globe&desc=RED+CLOUD+GONE+TO+FINAL+REST&pqatl=google. Retrieved 2008-05-29. "Famous Sioux Chief Lived to be 89. Rated as the Wiliest Enemy of Whites in Modern Times. Cornered in 1869, Friendly, as a Rule, Ever Since. Red Cloud, the famous old Sioux Indian chief, is dead, according to Supt Brennan of the Pine Ridge Indian agency, who is in Washington, attending the meeting of those interested in the education of the..."
↑ "Red Cloud Dead". Hartford Courant. December 11, 1909. http://pqasb.pqarchiver.com/courant/access/766170782.html?dids=766170782:766170782&FMT=ABS&FMTS=ABS:AI&date=Dec+11%2C+1909&author=&pub=The+Hartford+Courant&desc=RED+CLOUD+DEAD&pqatl=google. Retrieved 2008-05-29. "Famous Sioux Indian Chief Was 86 Years Old. Red Cloud the famous old Sioux Indian chief is dead. This information was received today by Superintendent Brennan of the Pine Ridge Indian agency, who is in Washington attending the meeting of those interested in the education of the Indian." ↑ "Sending Our Love to Chief Red Cloud | Sustainable Development, Sustainable Livelihoods". Treeswaterpeople.wordpress.com. 2012-03-26. http://treeswaterpeople.wordpress.com/2012/03/26/sending-our-love-to-chief-red-cloud/. Retrieved 2013-04-20. Drury, Bob and Tom Clavin, 2013, The Heart of Everything That Is. Simon & Schuster. ISBN 978-1451654660. Allen, Charles Wesley; Allen; Red Cloud; and Sam Deon, 1997, Autobiography of Red Cloud: War Leader of the Oglalas. Globe Pequot Press. ISBN 0-917298-50-0. Olson, James C.,1965, Red Cloud and the Sioux Problem. University of Nebraska Press. LoC Catalog Card Number 65-10048. Wikimedia Commons has media related to Red Cloud. "Red Cloud". Chief of the Oglala Lakota. Find a Grave. Oct 25, 2002. http://www.findagrave.com/memorial/6878358. Retrieved Aug 18, 2011. "Chief Red Cloud's Great-Great Grandson on Native American Issues", video interview by Democracy Now!